Lyceum Lodge of research is proud to present the following lecture. Lecture Wednesday 18 March 2015. 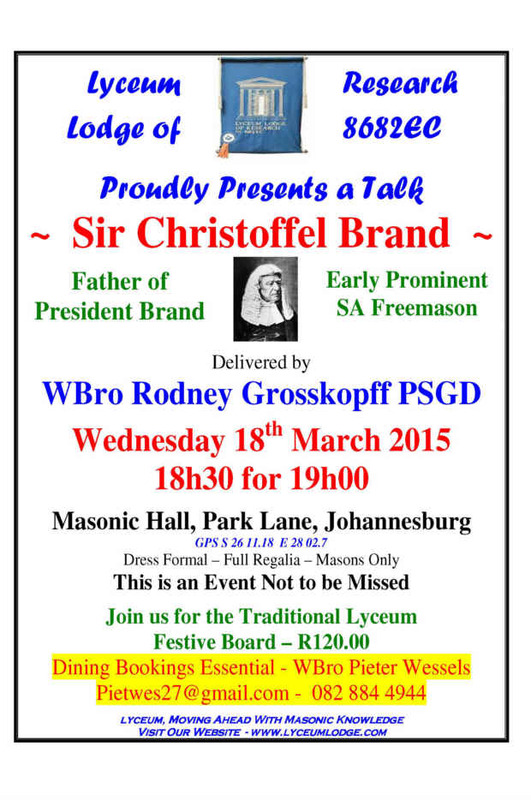 We proudly present a Lecture "Sir Christoffel Brand" delivered by W Bro Rodney Grosskopf PSGD on Wednesday 18 March 2015, 6:30pm for 7:00pm at Freemasons Hall, Park Lane. Booking essential, see the Flyer. Sir Christoffel Brand was the father of President Brand and a prominent early SA Freemason. Dress is full regalia, this presentation is for Masons only. To book, you can mail the Convenor.